The earthy smell of the deep forest surrounded us as we walked towards our destination. The forest seemed unnaturally silent, almost as if it were waiting for something. I led the way. Robin Mackall, the girl who had originally told me of the treasure, followed close behind me, holding a compass, which she would look at every once in a while to make sure we stayed on course. Although the midday sun shone brightly, the air was reasonably cold due to the fact that it was the end of March. The snow had melted away, leaving the ground cold and bare. Despite the cool temperature, my jeans stuck to my legs with sweat. We had been walking for over an hour, meticulously following each twist and turn specified on the map to be sure we ended up in exactly the right place. After all of our hard work over the past few months, we were so close to finding the treasure we had sought. Around six months ago, I’d met Robin Mackall at a party. She was several years older than me, and when I struck up a conversation with her, she told me of a golden idol dating from two hundred years ago. 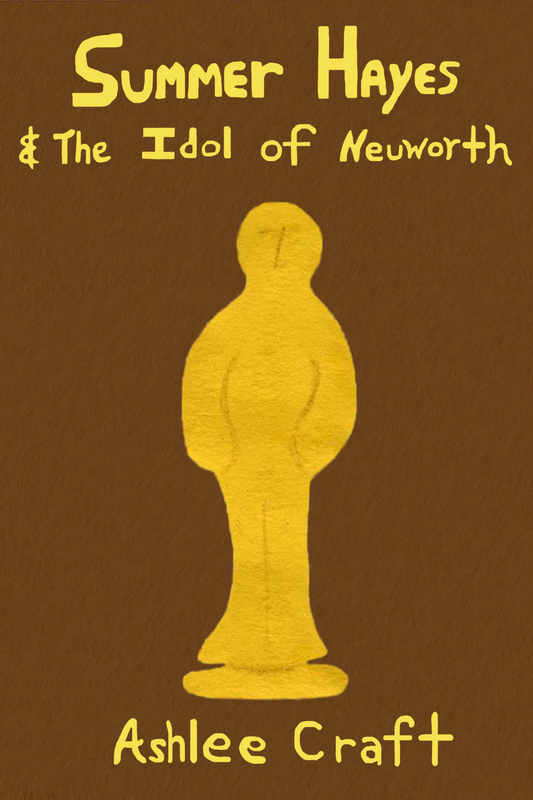 The Idol of Neuworth, it was called. According to legend, a rich European merchant named John Neuworth owned many precious jewels, including a flawless diamond about an inch and a half in diameter. His adversaries soon learned about the diamond he had in his possession and planned to steal the diamond and the rest of his jewels. John Neuworth was warned of this plan by one of his neighbors, who had overheard the adversaries talking about the heist. As Neuworth was a lonely man and his wealth was his happiness, he realized the best way to protect his riches was to disguise them. Without hesitation, Neuworth had a local artist build a special mold for his plan. He paid the artist so well for this job that the artist never had to work again. Then Neuworth took his prized diamond, best jewels, and a few gold bars to a local blacksmith. The blacksmith melted the gold into the artist’s mold using a special technique, placing the giant diamond in the center of the human-shaped idol. The other jewels were placed in random places amongst the gold statue. Although all of the jewels were originally concealed, the last time the Idol had been seen, bits of the gold had chipped and eroded away, revealing several of the jewels. John Neuworth had then painted the golden idol so that it would appear to be a stone sculpture rather than gold, then hid it somewhere on his property. Not long afterwards, John Neuworth was tracked down by his adversaries and went into hiding. In his frantic attempt to escape, the Idol of Neuworth was left on his property. Although Neuworth planned on coming back for the Idol, he was never heard from again. When Neuworth’s enemies searched the property, they found the Idol of Neuworth, although none of them realized its value at the time. They ended up dividing these items amongst their group. Just days later, the man who had ended up with the Idol of Neuworth dropped it onto the ground, chipping off a flake of paint and revealing the solid gold sculpture beneath. Two days later, when he was on his way to sell the Idol of Neuworth in town, he mysteriously drowned in the river, taking the Idol down with him. Years later, the Idol was found covered in algae at the bottom of the river by a young boy. The boy cleaned it up the best he could, but the Idol still remained slightly disheveled. He kept the Idol for several years, then unknowingly gave it to a band of criminals when they posed as experts in antique restoration and stole it from him. Two weeks later, the bandits were killed by muggers along the road as they traveled down the coast of England. Through the years, the Idol was lost and stolen many times. It found its way onto American soil and was lost and stolen many more times. Around seventy-five years ago, a man named Richard Payne discovered the Idol buried in the forest. After contemplating how much money he could sell the Idol for, he brought it to town. That evening, before the Idol could be appraised, Richard Payne was killed in a bar fight. The Idol of Neuworth seemed to be cursed in a way. If someone found it and kept it for reasons unrelated to greed, no harm became them, but someone always ended up stealing the Idol from them eventually. Every single person who came to possess the Idol by thievery or deceit ended up dead shortly after acquiring it. Robin and I reached the spot where the map indicated the Idol of Neuworth was hidden. Robin had inherited the map from her grandfather, who had died just weeks before I met her. The map was tattered and yellowed, but still readable. I kneeled on the ground, quickly pulling my brown hair into a ponytail to keep it out of my eyes. I was wearing two thin jackets to keep warm, a black jean jacket on the outside, and underneath that, a blue cotton sweater. Both jackets had been unzipped as the day warmed. My hands were slightly chilled, so I rubbed them together. Robin brushed a cobweb off of her coat and checked both her blue jeans and red cowboy boots for spiders. Robin and I removed our small folding shovels from our bags and began digging. Minutes later, my shovel hit something hard. A muted metallic sound rang out from the shallow hole. Hurriedly, Robin and I cleared dirt off the top of the object. I lifted a metal box from the hole. The box was about nine inches long, five inches wide, and four inches thick, and weighed several pounds; the exterior was covered in rust spots. It felt cold and damp against my skin. I gently set the box on the ground in front of me. I noticed that the lid had hinges on it, but no padlock. I tried to open it, but it wouldn’t budge. Quickly, I reached into my pocket and removed my multi-tool, something I always kept on me. Carefully, I unfolded the multi-tool’s awl and wedged it under the rim of the box, then pried upwards. With a creaking and groaning sound, the lid abruptly came unstuck. I put the multi-tool back in my pocket and opened the lid. Inside the box was a bundle wrapped in old, rotting linen. Gently, I picked the bundle up out of the box and unwrapped the cloth from around the object. The Idol of Neuworth, golden and gleaming, sat in my hand. I felt the cool smoothness of the gold against my skin. After all the time I’d spent searching, I finally held the prize in my hand. Robin gasped and put her hand over her mouth. The Idol stood about seven inches tall and was about two and a half inches wide. It resembled a slightly primitive Oscar medal and had a square base on the bottom of it. In my mind, I could see the way the Idol had once been painted. I could see the diamond in the center of it and the other jewels hidden in the folds of gold. My thoughts turned to everyone who had ever possessed the Idol, all the history surrounding it, and it seemed to amazing that in that moment, I had become part of that history as well. I suddenly heard the click of a gun being cocked to my left. Robin was standing there pointing a pistol at me. Needless to say, I was unamused. “Come on, Robin, what are you doing?” I said. Although I doubted she would actually use the pistol against me, I was still cautious. While I had my knife, a knife is little match for a gun. Robin’s face remained locked in an angry glare. “Hand it over.” She said, trying to sound threatening but failing horribly. I sighed and slowly stood up so that we could talk face to face, as equals. “Do you really expect me to be afraid of that?” I asked her, nodding towards the gun. I was still clutching the Idol, for if Robin got it too soon and she truly was intending to kill me, she wouldn’t waste any time. Besides, I didn’t want to relinquish the Idol unless I was forced to. At that moment, Robin snapped her fingers. “How about this?” She asked. Suddenly, three men and one woman stepped from behind trees in the surrounding areas, all holding pistols which were pointed at me. They stood about twenty feet away and were surrounding me from all sides. I glanced around at them but didn’t recognize their faces, so I took a mental image of them so I’d recognize them if we should meet again. I chuckled, partially with annoyance, partially with trying to disarm them with the illusion that I would cooperate. If I acted defensive, they’d tense up, and I would not be able to carry out the plan I was formulating in my mind at that very moment. Robin smiled smugly and snapped her fingers again. One of the men walked up to me and restrained me by the back of my jacket as Robin began circling me like a vulture. The man removed my knife and multi-tool from the pocket of my jacket and handed the tools to the woman, who set them on a rock nearby. I looked around at Robin’s wonderful little murderous buddies, and noticed that the woman and one of the men seemed to be paying more attention to each other than to me. Good. That meant that something – possibly their relationship or potential relationship with each other – was distracting them. Also, their guns were held with a fairly relaxed grip, and they were reasonably far away from the others. Running towards them would be my best chance for escape. I could tell by Robin’s hesitance that she didn’t really want me killed, which gave me some confidence. I moved my hands, gesturing for Robin to hold on a minute. I held the Idol of up in front of my face, turning it in the gleaming sunlight, pretending to be enchanted by it. In reality, I was preparing to escape. As any good adventurer knows, whether you have a good plan or not can be the difference between life and death, so I always make sure that my plans are as foolproof as possible before acting upon them. I continued examining the Idol. Without removing my eyes from the Idol, I spoke. At that, Robin raised her gun and pointed it at my forehead. She was only four feet or so away from me. Although Robin had told me that she was a notoriously bad shot, from this distance, there was no doubt that she would hit her mark. Robin’s face was set in steely determination, and I could see by the look in her eyes that she was prepared to kill me if necessary. I was playing a very dangerous game of chicken, waiting for the right time to make my move. If I moved flinched too soon, they would kill me, and if I moved too late, the result would be the same. I looked from Robin to the gun to the man restraining me. The man had put his gun in his pocket, as he was gripping my jacket with both hands. Out the corner of my eye, I took note of where my weapons were and how I could get them back on my way out of here. Although there was a chance that I might need a weapon before I escaped from them, it would be too risky to try to retrieve these items as I made a run for it. I kept my gaze locked on Robin as I held the Idol out towards her. Robin cautiously stepped towards me, and her gun got closer to my forehead. Robin smiled smugly and held onto it with one hand as she reached for the Idol with the other. Her fingers closed around the Idol and she removed it from my grasp. With all my strength, I kicked backwards into the man restraining me, hitting him sharply in the shins. I ducked out of my jacket and underneath his arm as his knees buckled. Robin fired the gun as fast as she was able to, but I was already several feet from her and the man. Instead, a bullet that was destined for me – a bullet destined to take my life – hit the shoulder of the man I had just escaped from. I tore the Idol from Robin’s hand as I passed by her, then took off running like never before. The man, shouting expletives and grasping his bleeding shoulder, grabbed his gun and and began shooting. Bullets whizzed past me. I heard them whistling through the air around me as I sprang from their path. I heard the hollow sound of them hitting trees, ricocheting off stones, and snapping tree branches, but I kept running. My heart was pounding, and for several moments, that and the sound of my footsteps in the leaves were the only things I heard, for my concentration was solely on escaping the criminals. Suddenly, I heard footsteps approaching quickly. I looked back towards where the footsteps were coming from and saw the man and woman rushing at me, shooting as they approached. Robin and the second man crashed through the underbrush, but the man Robin had shot was nowhere to be seen. Had she injured him so greatly that he couldn’t take part in the chase? Or was he waiting up ahead to head me off? Without giving them time to shoot me, I zigzagged though the forest, making me a much harder target. I heard a large snap sound from directly behind me. For one terrible moment, I wondered if I’d been shot, but when I looked back, I saw that a branch, around six inches in diameter, had been shot down from a tree. It landed heavily in the exact spot in had been standing in just moments ago. A gunshot erupted behind me, a gunshot which sounded closer and more accurately aimed than the others had. I felt the power of a bullet rushing past me. When I looked down, I saw that the bullet had blown a hole in my blue jacket, which had been flapping in the breeze. This only made me more determined to escape from them, but also more concerned that I would not survive this chase. The Idol of Neuworth was secured tightly in my hand, but I decided it would be safer somewhere else. I shoved it into my satchel and zipped it shut with one hand as I ran. I heard more shouting behind me, and as I glanced back, I saw Robin and the others starting to fall behind. Bullets peppered the air, and many struck the surrounding trees. I ran faster than ever, knowing I had to put as much distance as possible between them and me. I looked up ahead and saw that there was a bend on the trail we were following. As I neared the corner, I could see that the trail branched out over a rocky hillside. The path was very narrow, and if someone wasn’t paying attention, it would be incredibly easy for them to go over the edge and tumble to their death. Just as I was about to turn the corner, an idea struck me. I looked back, and although I could hear the sound of Robin and the others approaching, they were not in sight. Thinking quickly, I tore off my jacket and set it on top of one of the medium sized boulders. The sound of shouting and footsteps grew louder. Now was the time to set my plan in motion. Literally. I shoved the boulder down the side of the hill. As it fell, it caused a shower of smaller stones, and I could see the blur of the bright blue jacket against the paleness of the boulders. I took off running, hoping that Robin and her buddies would see the tumbling boulders, which would either distract them enough to give me more time to escape, or even better, would cause them to think I had fallen down the hill and begin looking for the Idol down there. As I bolted away from the hillside, I heard the shouting grow louder. “You two! Get down there and start looking for it! And stop acting like two stupid lovebirds!” Robin screamed at the top of her lungs. I heard the sound of two people running and knew that Robin and the second man were still on my trail. How could I escape from them? I had to be nearing the edge of the woods by now. How much longer could either of us hold out? There was no doubt that I was in better shape than Robin, but I was unsure as to whether I could outrun the second man. Suddenly, I heard the sound of a highway through the trees ahead of me. I bolted even faster towards the sound, knowing that safety was near. Moments later, I came to the edge of the forest and emerged from the trees. The roadway was just a few feet away from me, and the cars were coming to a stop at the red light. Traffic was dense on this three lane, sixty mile-per-hour road. As soon as the cars had stopped, I ran across the lanes, weaving around the stopped cars and making it safely to the other side. The light turned green, and traffic started up again. Cars zoomed past, and I quickly headed in the direction of home. I glanced back, only to see Robin and the second man had emerged from the forest, coming face to face with the road. It would have been impossible for them to cross the street, considering the speed of the cars and the heavy traffic on the road. I was truly safe, at least for the time being. But this sense of security would not last long.